Automatic self-winding movement. Rhodium-plated with fausses cotes embellishment. 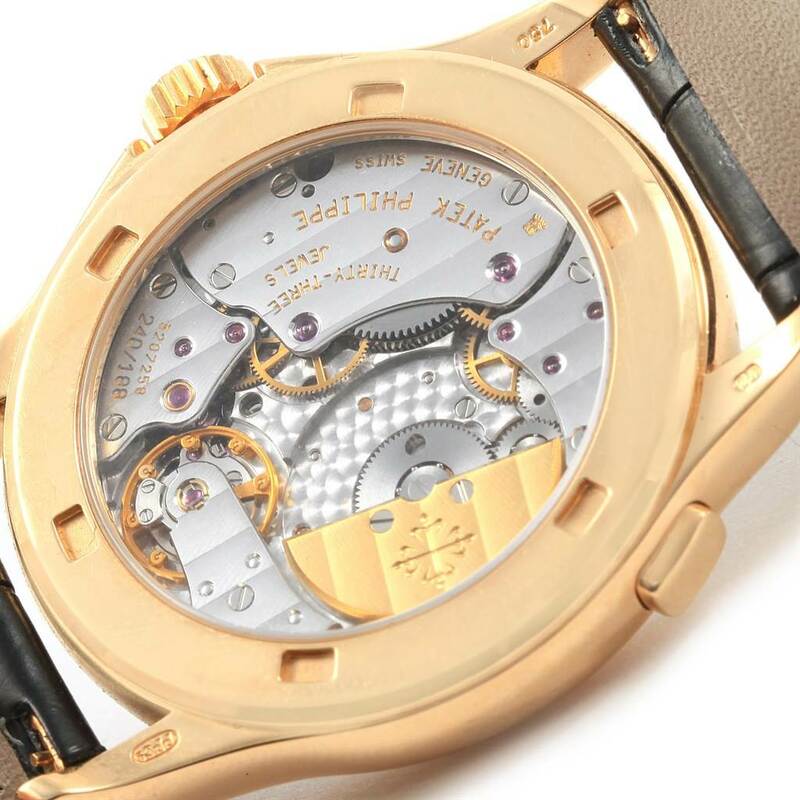 Straight-line lever escapement, a 22K gold mini rotor, an anti-shock device, and a monometallic Gyromax balance. Self-compensating free-sprung flat balance spring. 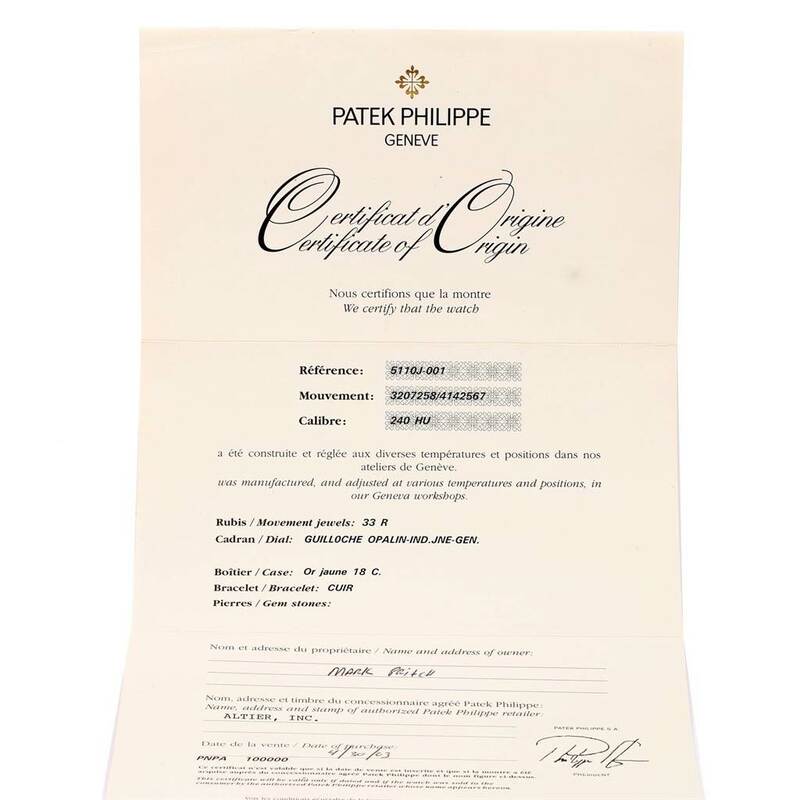 Stamped with the Patek Philippe seal. 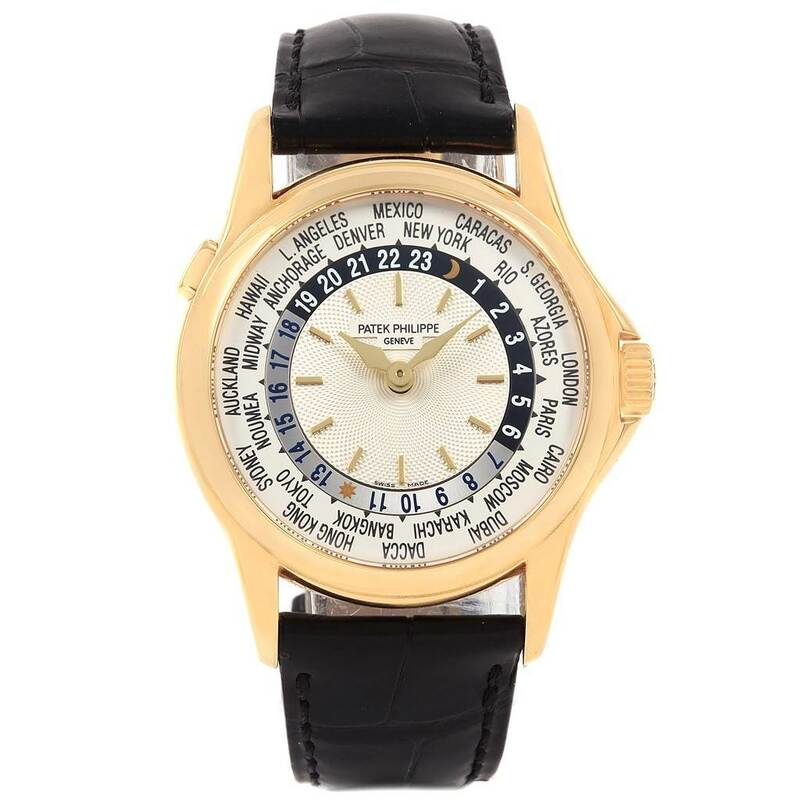 18k yellow gold case 37 mm in diameter. Crown with protective shoulders, pusher at 10 o'clock to change cities, screw-down sapphire crystal exhibition case back. Silvered dial with engine turned sunburst center, applied baton hour markers, concentric chapter ring calibrated for 24 hours divided into diurnal and nocturnal hours, outer ring with 24 world cities. 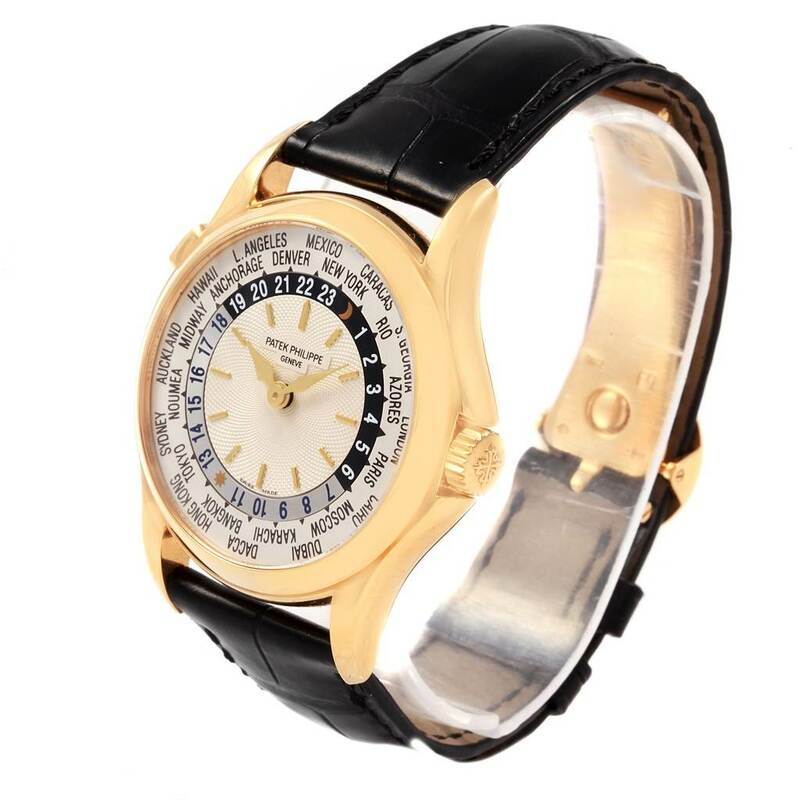 Black leather strap with 18K yellow gold deplyent buckle. 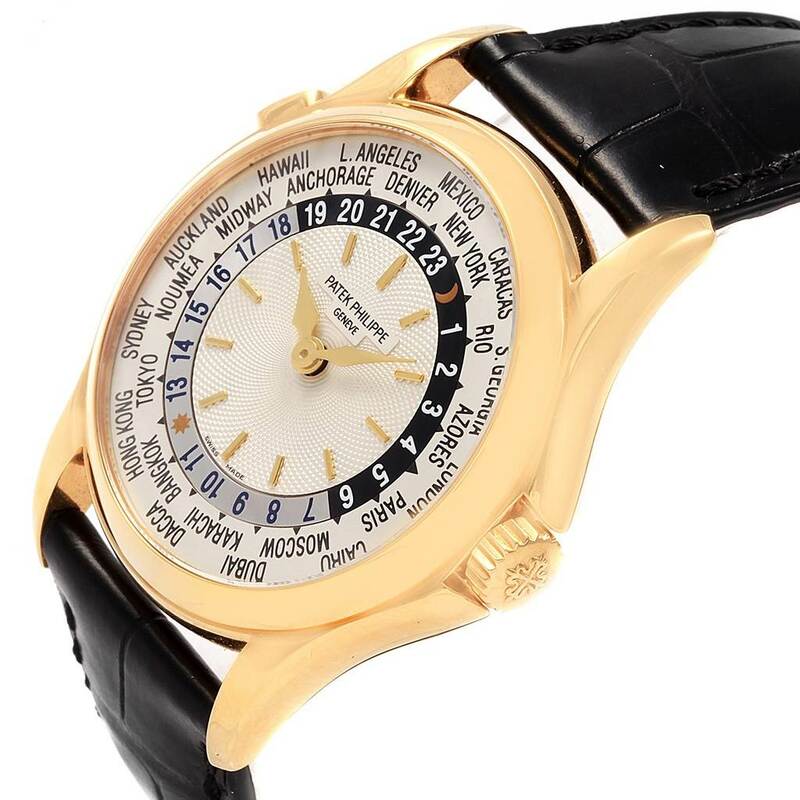 Patek Philippe World Time Complications Yellow Gold Watch 5110J. Automatic self-winding movement. Rhodium-plated with fausses cotes embellishment. 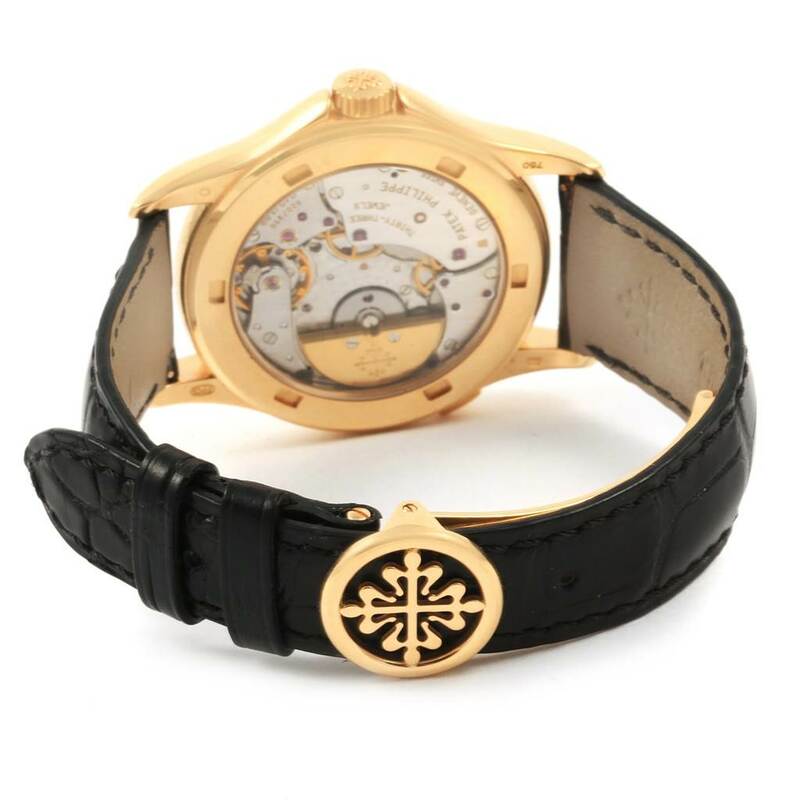 Straight-line lever escapement, a 22K gold mini rotor, an anti-shock device, and a monometallic Gyromax balance. Self-compensating free-sprung flat balance spring. 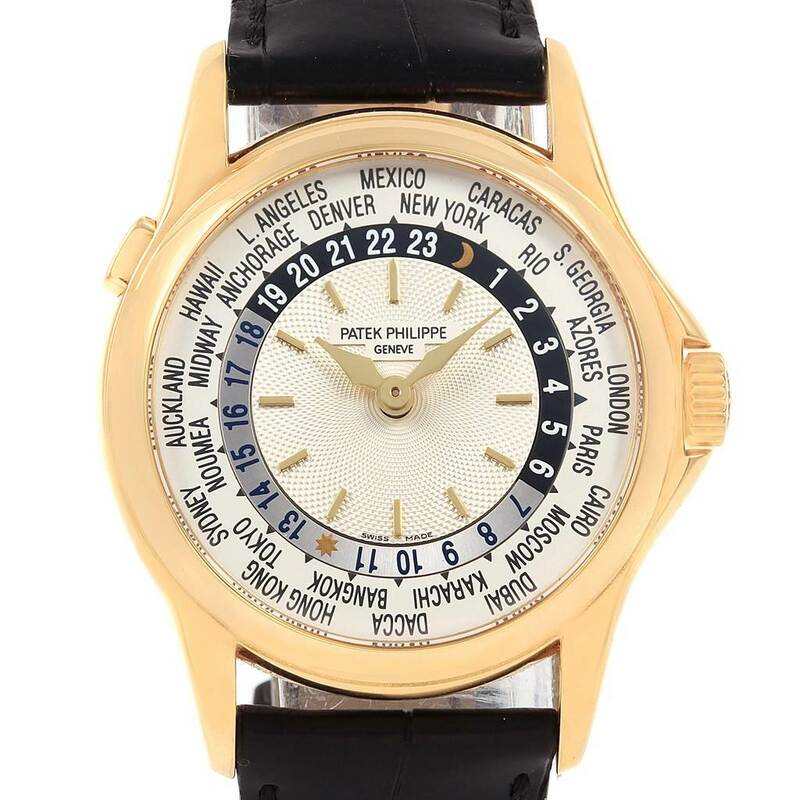 Stamped with the Patek Philippe seal. 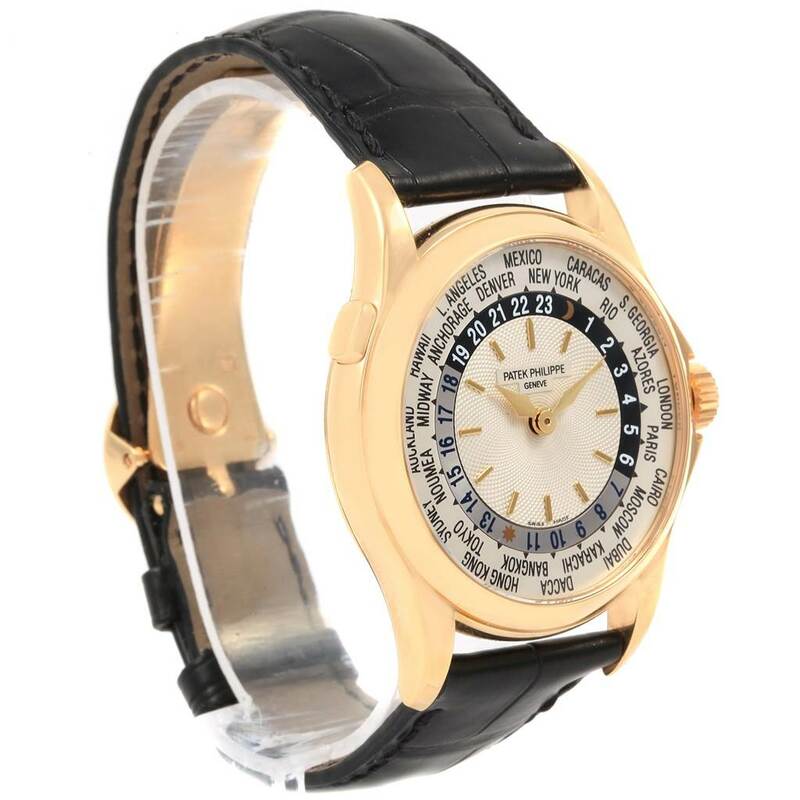 18k yellow gold case 37 mm in diameter. 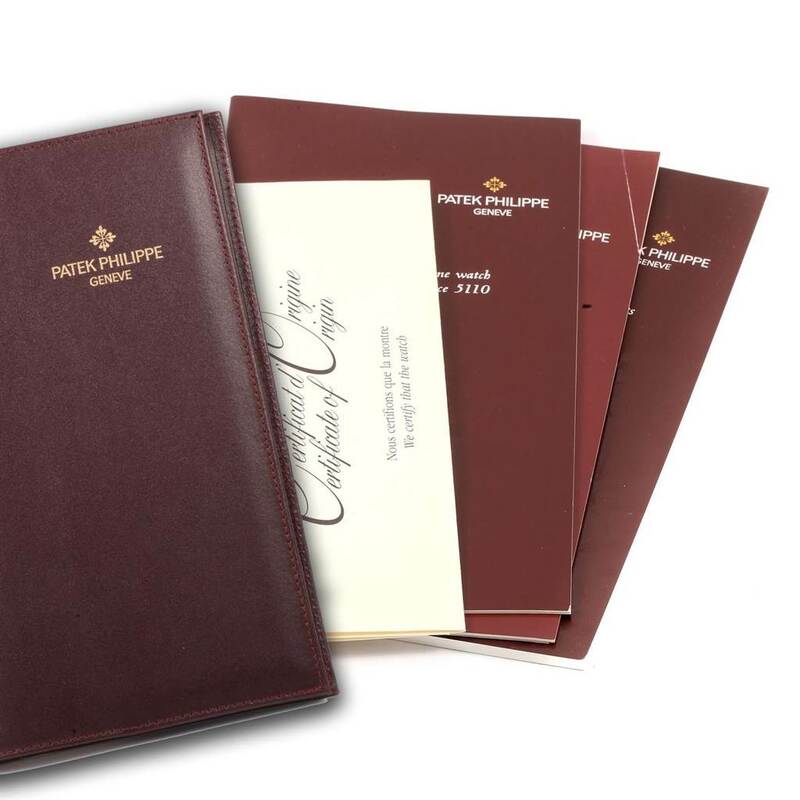 Crown with protective shoulders, pusher at 10 o'clock to change cities, screw-down sapphire crystal exhibition case back. 18k yellow gold smooth bezel. Scratch resistant sapphire crystal. Silvered dial with engine turned sunburst center, applied baton hour markers, concentric chapter ring calibrated for 24 hours divided into diurnal and nocturnal hours, outer ring with 24 world cities. Black leather strap with 18K yellow gold deplyent buckle.